Regina garage-punk band The Steves play simple pop songs with uncomfortable urgency. They were brought together by Piper Burns who had grown tired of playing drums to other peoples songs and embarked on writing his own. The result is straight forward pounding rhythms and loud guitars. They take their cues from bands such as The Modern Lovers and Jay Reatard. Since their formation the band has released two double videos and an EP. 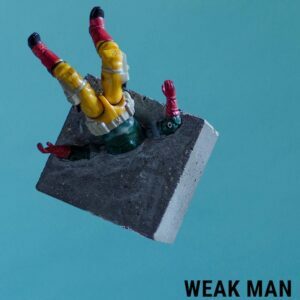 Their debut album, “WEAKMAN” was recorded with Chris Dimas (Surf Dads) and was released on Grind Central Records/Sweety Pie Records on September 9th, 2017 and is their most visceral and accurate portrayal to date. The Steves have been steadily growing a following across the prairie provinces and are excited to begin touring elsewhere across the country in the coming year.